AIRPORT JOBS: A Leading Multi-National Facility Management Co. 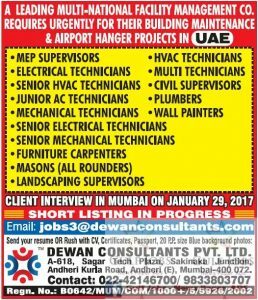 Requires Urgently for Their Building Maintenance & Airport Hanger Projects in Uae. Mep Supervisors, Hvac Technicians, Electrical Technicians, Multi Technicians, Senior Hvac Technicians Civil Supervisors, Junior Ac Technicians, Plumbers, Mechanical Technicians, Wall Painters, Senior Electrical Technicians, Senior Mechanical Technicians, Furniture Carpenters, Masons (All Rounder’s), Landscaping Supervisors. Client Interview in Mumbai On January 29, 2017. Short Listing in Progress. Send Your Resume or Rush with Cv Certificates, Passport, 20 Pp Size Blue Background Photos: Dewan Consultants Pvt Ltd A-618, Sagar Tech Fplaza, Sakinaka Junction Andheri Kuria Road, Andheri (E), Mumbai 400,072. Contact: 09833803707.